After the disastrous The Black Cauldron in 1985, Disney’s animation division wobbled on the ropes. That flick was a costly experiment that failed in most ways, and it nearly killed the studio’s bread and butter. In retrospect, the notion sounds absurd, what with the studio’s large roster of hits that emerged since then, but at the time, the possibility seemed all too real. Disney animation wouldn’t fully rise to its feet until 1989’s The Little Mermaid, but they started to snap back in 1986 with The Great Mouse Detective. 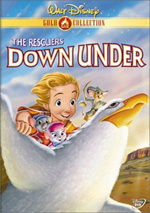 A modest film in every sense of the word, the flick enjoyed a much smaller budget than did Cauldron, but it also suffered from much lower expectations. A small-scale and genial little piece, Detective felt almost like a throwaway movie, but that was just what the studio needed. The genial piece didn’t become a blockbuster, but it provided a decent success with both audiences and critics at a crucial time and definitely contributed to the studio’s resurgence that would soon arrive. Detective provides a simple narrative. The henchmen of evil villain Ratigan (voiced by Vincent Price) kidnap ingenious inventor Hiram Flaversham (Alan Young) for nefarious means. His daughter Olivia (Susanne Pollatschek) seeks help and goes after master detective Basil of Baker Street (Barrie Ingham). Though initially resistant, the adorable little girl eventually convinces Basil to take the case, though it helps that Basil’s newly-acquired assistant Dawson (Val Bettin) takes her side. From there the movie talks a fairly obvious path. Basil pursues leads to find out what happened to Mr. Flaversham - he doesn’t know from the start that his archenemy Ratigan is at work - and tries to solve the case. Once he and Ratigan meet, they battle wits, and Basil needs to use a number of clever ways to defang his foe. Little about Detective strays from the genre’s essentials - except for the cast of animals, of course - but that works well for the film. Everything about the project seems unassuming, and given the occasionally overblown nature of some Disney projects, the smallness of scale comes as a relief. Detective doesn’t aspire to be a rousing blockbuster; instead, it simply wants to offer some modest entertainment for its brief running time. However, I must admit this is both a blessing and curse. On the negative side, Detective moves rather slowly at times. It picks up nicely during its third act, but the prior two could plod. The animation also seems weaker than usual for Disney. Lip-synch looks off at times, and transitions often flow poorly. In addition, colors change awkwardly during Ratigan’s production number; I have no doubt that the stylistic changes would have occurred less clumsily in other Disney flicks. While I appreciate the modest tone of Detective, it does seem somewhat bland at times. The heroes all come across as likeable but little more, as they fail to create very distinctive personalities. The villains fare better, however, especially due to the lively and engaging performance by Price. Ultimately, The Great Mouse Detective provides a generally enjoyable piece of work. The movie fails to become terribly vibrant or compelling, but it chugs along well enough to keep the viewer engaged. Some of its charm stems from its small scale, as the film never tries to overwhelm the viewer. Instead, it’s just a reasonably charming little flick. 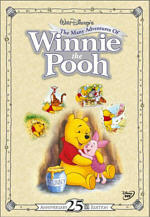 Footnote: the film has appeared under a number of different titles. Originally called The Great Mouse Detective in the US, Disney redubbed it The Adventures of the Great Mouse Detective for a Nineties reissue; I guess they figured the word “adventures” would pull in the kiddies. The opening credits to the DVD use that moniker, but everywhere else they call it simply The Great Mouse Detective. For audiences in some places outside of America, it went by Basil: The Great Mouse Detective, a title closer to the original novel’s Basil of Baker Street. 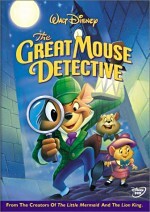 The Great Mouse Detective appears in an aspect ratio of approximately 1.66:1 on this single-sided, dual-layered DVD; the image has been enhanced for 16X9 televisions. Many of Disney’s animated flicks from the Eighties don’t look so hot, but Detective provided an exception with its solid picture. Sharpness seemed solid. The image always remained nicely distinct and accurate. I detected virtually no signs of softness during this crisp and detailed presentation. Jagged edges and moiré effects created no concerns, and I also noticed no signs of edge enhancement. In regard to print flaws, grain seemed noticeable at times. It never became heavy, but it appeared somewhat excessive on occasion. Otherwise, the movie looked very clean. I noticed the occasional speckle, but most of the time, the image remained free from defects. Though virtually all of Detective took place at night, the film still boasted a reasonably varied palette, and the DVD replicated those tones well. The colors seemed nicely bright and vivid throughout the movie. The appeared tight and concise as well, and they showed no concerns related to bleeding, noise, or other issues. Black levels seemed deep and rich, while shadow detail was appropriately heavy but not overly thick. Overall, The Great Mouse Detective provided a very satisfying visual presentation. While not quite as good, the Dolby Digital 5.1 soundtrack of The Great Mouse Detective seemed satisfying. Given the age of the material, I didn’t feel surprised to discover that it largely emphasized the forward channels. Within that domain, music showed very nice stereo imaging and presence. Effects spread reasonably well across the front spectrum, and the elements moved acceptably naturally, but the score and songs remained the most prominent parts of the track. The rear speakers played a small role, as they mainly contributed general reinforcement of music and effects. Audio quality varied but generally seemed good. Speech usually sounded acceptably distinct and warm, but the lines occasionally suffered from noticeable edginess. Effects lacked distortion and occasionally showed nice life; for example, the stomp of Felicia the cat presented the appropriate low-end impact. Effects sometimes sounded a bit flat, but they worked well for the most part. The score usually seemed nicely rich and vibrant, but some of the film’s songs didn’t succeed quite as well. The various tunes remained clean and clear, but they lacked great range and seemed somewhat thin. Nonetheless, The Great Mouse Detective still provided a reasonably positive auditory experience for its age. The Great Mouse Detective includes a small collection of supplements. The Making of The Great Mouse Detective provides a short and perfunctory featurette. It runs a mere seven minutes and 50 seconds and mixes shots from the movie, some behind the scenes clips, and interview snippets. 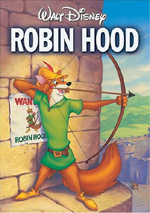 In the latter domain, we hear from studio executive Roy E. Disney, supervising animator Glen Keane, actors Barrie Ingham, Val Bettin, and Vincent Price, singer Melissa Manchester, composer Henry Mancini, and animator Phil Nibbelink. The program seems quite superficial and provides very little information about the production. We get a couple of decent tidbits but not anything particularly noteworthy. Detective packs two classic Disney shorts. From 1937, Clock Cleaners runs eight and a half minutes and stars the trio of Mickey Mouse, Donald Duck, and Goofy. The boys work as clock cleaners - natch - and run into the usual troubles as they perform these activities. It’s a decent piece but it didn’t do a lot for me. Note that apparently some of Donald’s speech was redone at one point. From what I understand, some of his lines sounded like profanity and have been altered. I didn’t notice anything that resembled nasty language, so this appeared to offer the “fixed” version. From 1945, we get Donald’s Crime, an eight-minute short in which the Duck steals from his nephews to finance a swinging date with Daisy. He goes through the standard internal debate over the event. It’s a moderately entertaining morality tale but not one of Donald’s best efforts. Like many Disney DVDs, we find another Sing-Along Song here. This one accompanies Ratigan’s “The World’s Greatest Criminal Mind”. I never could figure out what someone so inclined couldn’t just turn on the movie’s subtitles to do this, but if you dig sing-along songs, have a party! The Great Mouse Detective Scrapbook includes a thumbnailed still gallery. Over 15 screens we discover 47 images. These offer a nice mix of character designs, production photos, advertising materials and other components. From the main menu, you’ll discover a Sneak Peeks area that includes a selection of ads. We find clips for The Rookie, Mickey’s House of Villains, Monsters, Inc., Beauty and the Beast, Inspector Gadget 2, Teamo Supremo, Rolie Polie Olie: The Great Defender of Fun, 101 Dalmatians II: Patch’s London Adventure and Schoolhouse Rock. Unlike many Disney DVDs, none of these appear automatically when you start the disc; you need to access all of them via the “Sneak Peeks” menu. No one will ever confuse The Great Mouse Detective for classic Disney, but it succeeds better than most of their material from the Seventies and Eighties. The movie’s modest scope allows it to rely more strongly on character, and it seems unusually - and pleasantly - quiet and thoughtful. The DVD provides very solid picture quality along with decent audio and a modest roster of extras highlighted by two Disney shorts. Detective doesn’t reside high on my list of Disney favorites, but it offers a generally satisfying experience nonetheless.